The Art Stays Festival of Contemporary Art is returning for its fourteenth edition with a rich programme and many new features. Art Stays is one of the most prominent presentations of contemporary art, especially of fine arts in Slovenia and Central Europe. Ever since 2003 it brings the latest in art, be it the well-know artists with their work hanging in museums, collections and guests at biennales, or those most promising talents - they all are invited to Ptuj. More then 600 artists have participated at the festival during the years. Squares and buildings of the oldest city in Slovenia will offer exhibitions, performances, workshops, film screenings and other events from the most contemporary art production. More then 100 artists will be presented on the festival, as well as different types of contemporary art: photography, painting, sculpture, video, installations, performance and intermedia projects. 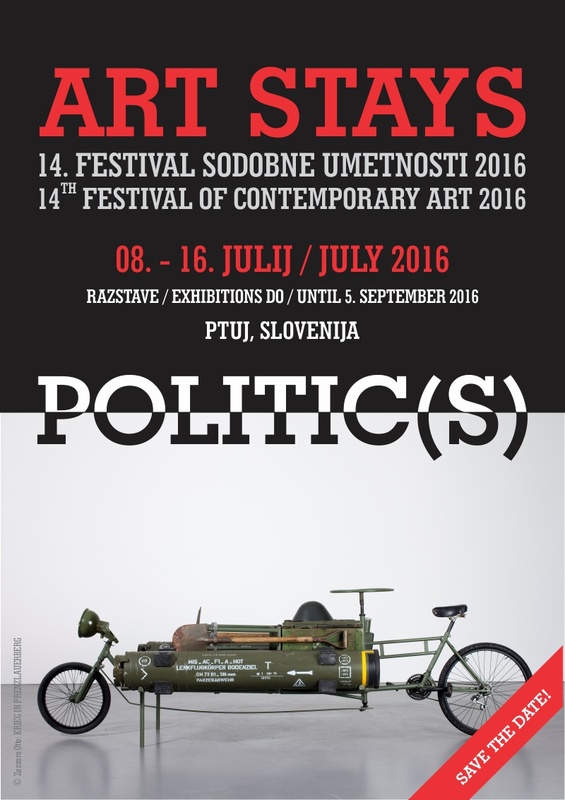 The 14th edition of the festival has the title POLITIC(S), the focus for this year is „political art“. The programme was prepared and curated by Jernej Forbici and Marika Vicari in collaboration with international galleries, museums, and a team of international curators with the special participation of the independent Chilean art curator Antonio Arevalo, Anna Balvanyos from the Ludwig Museum of Budapest, the Slovenian art curator Peter Tomaž Dobrila, and Manuel Frara from the Academy of Fine Arts of Venice. Title POLITIC(S) was born from a reflection about the relations between politics, dialogue and language, especially in the field of arts that we discussed and observed in the last 13 years of ART STAYS. We as artists, curators, people that work with culture in general, have the responsability to represent and discuss about the POLITIC(S) in the form of choices, languages, wonderings, human rights, power, political and social system, war, terrorism, new identity, migracy, activism, propaganda, laboratories and communications. 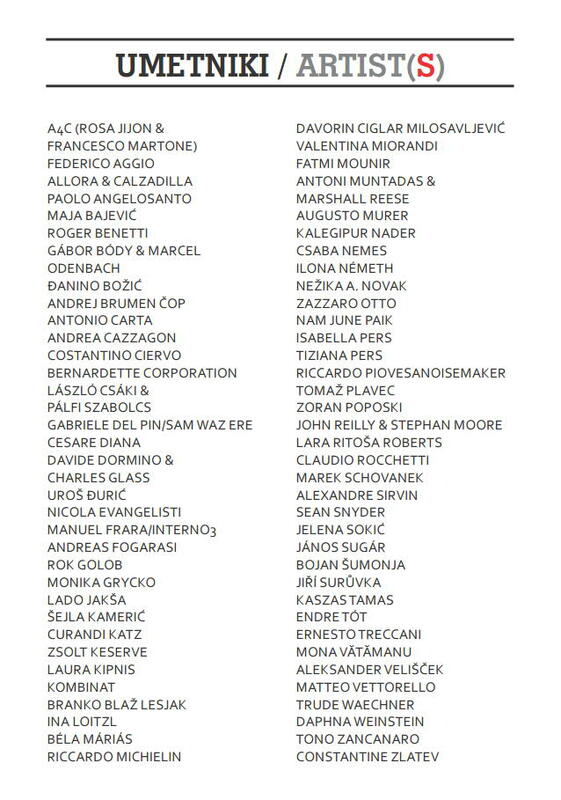 Allora & Calzadilla, Maja Bajević, Paolo Angelosanto, Costantino Ciervo, Uroš Đurić, Nicola Evangelisti, Andreas Fogarasi, Gábor Bódy, Marcel Odenbach, Šejla Kamerić, Rok Golob, Monika Grycko, László Csáki, Pálfi Szabolcs, Zsolt Keserve, Ina Loitzl, Bela Máriás, Fatmi Mounir, Ilona Németh, Nežika A. Novak, A4C (Rosa Jijon/Francesco Martone), Valentina Miorandi, Csaba Nemes, Zazzaro Otto, Isabella Pers, Tiziana Pers, Tomaž Plavec, Zoran Poposki, Lara Ritoša Roberts, Sean Snyder, Bojan Šumonja, Jelena Sokić, János Sugár, Jiří Surůvka, Kaszas Tamas, Endre Tót, Mona Vătămanu, Aleksander Velišček, Daphna Weinstein, Constantine Zlatev, group The Area of Bustle: Gabriele Del Pin, Cesare Diana, Claudio Rocchetti, Manuel Frara/Interno3, Riccardo Michielin, Riccardo Piovesan, Matteo Vettorello, Federico Aggio, Alexandre Sirvin, Andrea Cazzagon and others. A group show will be presented at Mihelič Gallery, dedicated to POLITICAL PRINT in collaboration with National Museum of Contemporary Ljubljana and Stamperia d'Arte Busato. THE PACIFIST LIBRARY, a nomadic project made by Curandi Katz, will also include a series of performances around the town of Ptuj. A retrospective exhibition, remembering the fourteen years of the Art Stays activity in the city of Ptuj, will be on display at Magistrat Gallery in the Town Hall. Site specific performances were created especially for 14th ART STAYS festival by Jiří Surůvka, The Area of Bustle, Costantino Ciervo and A4C (Rosa Jijon/Francesco Martone). ANYTHING TO SAY? a large size bronze sculpture made by Davide Dormino and Charles Glass presented in the heart of the city, at Mestni trg Square will demand and offer the possibility to act, to stand up and speak or express a personal opinion. Concert and multivision of Lado Jakša, a big concert of Women's Choir Kombinat, screenings of Antoni Muntadas and Nam June Paik, lectures and talks by Rosa Jijon, Bela Máriás, Zoran Poposki, artists of The Area of Bustle on the Slovenski trg Square, workshops for children curated by CID in collaboration with ART STAYS and for adults dedicated also to the engraving by Giancarlo Busato and photography by Davorin Ciglar Milosavljević. Continuing the traditional collaboration with Mestni kino Ptuj and CID, ART STAYS KINO will present films and videos by Bernadette Corporation, Laura Kipnis, Antoni Muntadas & Marshall Reese, Nam June Paik, John Reilly & Stephan Moore. 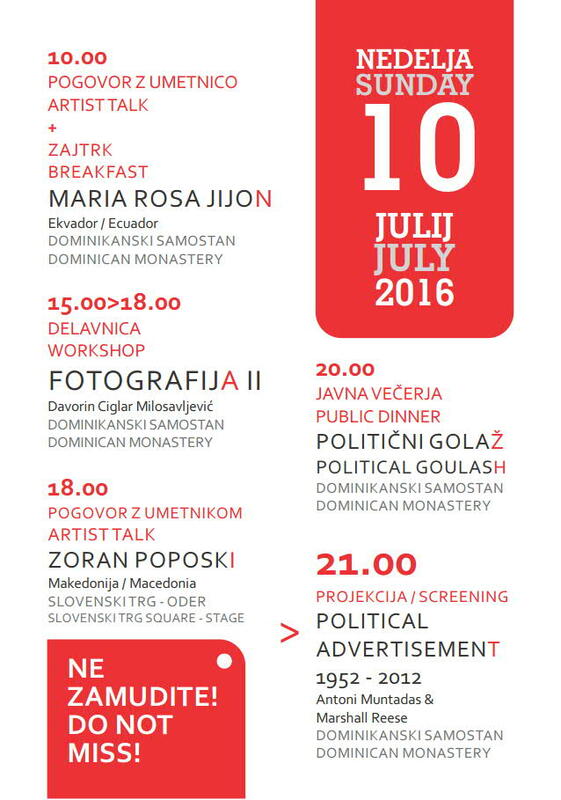 The Festival will start on Friday, 8th July 2016 with the opening of the main exhibition entitled POLITIC(s) at the Dominican Monastery of Ptuj and a small performance by Jiří Surůvka. The concert of a famous Slovenian Women's Choir KOMBINAT will follow on a stage in Slovenski trg. The Festival will continue until 16th July on different venues of Ptuj with over 30 events. Exhibitions will be open until 5th September in different exhibition spaces.